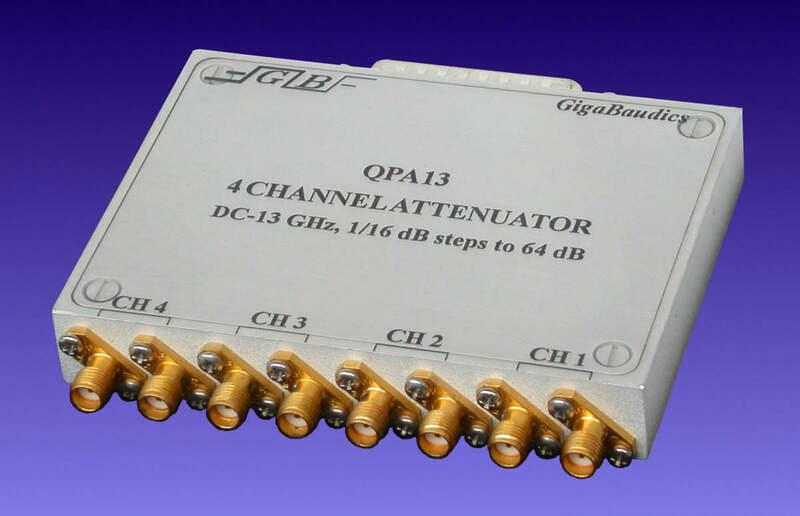 The QPA13 is a 4 channel programmable attenuator designed for adjusting the amplitude of radio and microwave signals of bandwidths from DC to 13 GHz. This device has low impedance mismatch, high bandwidth, wide dynamic range and is capable of rapid state change. The QPA13 can be an attractive alternative to either the manually operated microwave attenuator switches, which are expensive and are switched very slowly, or the relay attenuators which are expensive and wear out quickly. The QPA13 is specifically designed to minimize any phase shift between attenuator states. The maximum phase deviation between any attenuation states is determined by the maximum delay shift of +/- 10 ps.. The maximum phase shift between consecutive attenuation states is typically 2 to 3 picoseconds. This device is specially calibrated to maintain high accuracy at the control word major-carries so that attenuation states do not overlap or have large errors at these points. The QPA13 employs all GaAs passive microwave switched-element and voltage variable techniques. Elements are switched in a series configuration so that each attenuation value occurs additively with any other switched-in attenuation. This also lends to an outstandingly low repeatability error of less than +/-0.02 dB. Active elements are thermally regulated to 50 0C. Inputs and outputs are connected by SMA jacks while data and control signals are connected by a standard 25 pin D-type connector plug. Power can be connected either through the D-sub connector or the banana jack. This device is provided in a low profile rugged aluminum housing and requires a single, low power, 5V supply making this instrument very easy to use. Fast, ACT control logic is used to support applications requiring rapid attenuation state change. This allows programming rates in excess of 20 MHz. 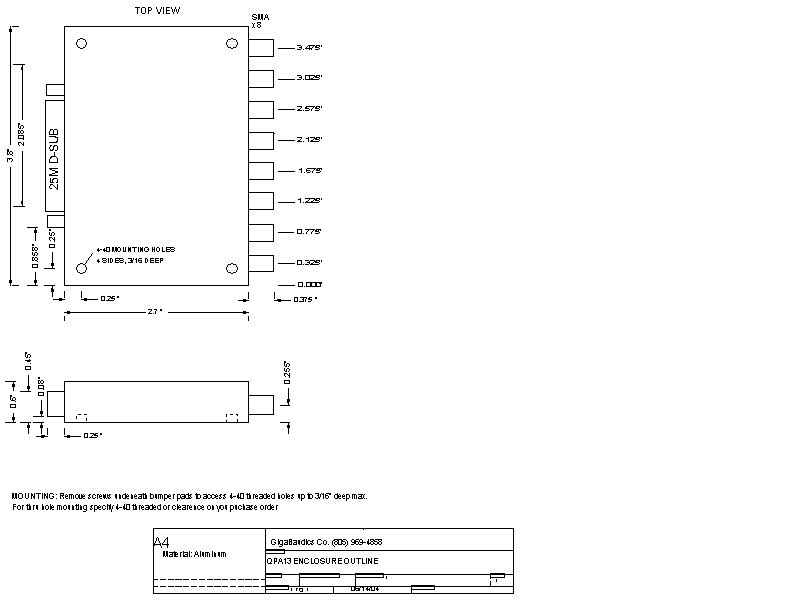 If higher programming speeds are required, or if 110 ohm input terminations to TTL threshold are desired, contact the manufacturer. The attenuation is equal to the 0.0625 dB step size times the 10 bit control word number. Each of the 10 bits corresponds to a separate attenuator element. Each channel is addressed (selected) by a separate address line AO, Al, A2 and A3. This allows any combination of channels to be identically programmed simultaneously. The WE (write enable) line is activated (low) while data is valid. The DS (device select) line, active low, is useful for selecting a particular unit when more than one unit is used in conjunction. Data, address and DS should be valid for at least 4 ns, after WE goes low and should remain valid 3 ns. after WE goes high. Programming can be done without using the WE or DS line by tying them low, applying the desired control word, then selecting the channel. When the channel is de-selected the control word will be latched in that channel. The control word need not be latched if the user wishes to operate the latches transparently. Simply keep the address line high, DS and WE low and the attenuation state of the selected channel(s) will follow the applied data. Option: -AC. This option provides AC coupling for use in applications above 2.5 MHz. This is recommended for applications that may have DC offsets on the input or output. Option price: $400. Phase deviation consecutive step: _+/-1 ps max. Repeatability error (dB):________+/- 0.02 dB max. The QPA13 uses a single 5V supply. The current requirement is 600 mA but it is typically below 400 mA at low programming rates. Internal supply voltages are regulated to eliminate supply noise coupling to the signal path. The input buffer uses the 5V supply directly all other internal voltages are generated from the 5V supply in order to simplify power-up.